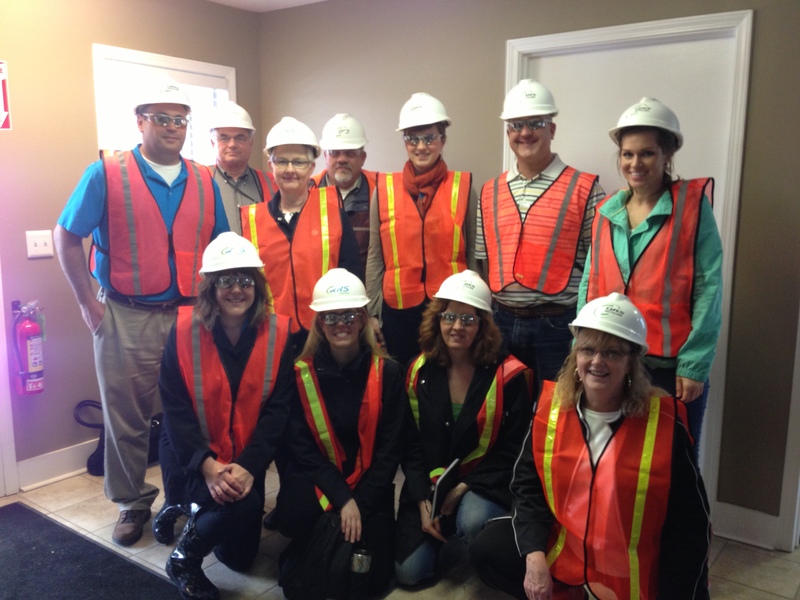 Every year the Unitarian Universalist Association conference planning team dons hard hats, safety vests and work goggles for an unusual field trip before General Assembly, the Association’s annual business meeting. The excursion takes us to the local recycling and composting facilities that will be receiving waste diverted from the event. This year we toured two locations near Louisville, Kentucky, the host location for General Assembly June 19-23, 2013. Along for the ride were representatives of the UUA staff planning team, Louisville Convention and Visitors Bureau, the Kentucky International Convention Center and Centerplate. Also invited were the United Methodist Women who are planning their own large conference in Louisville in 2014 and wanted to learn more about recycling and composting services available for their own event. Why do we go? Seeing is believing! By inspecting waste facilities in person we can have confidence event materials are being effectively diverted. We can also ensure working conditions are safe. 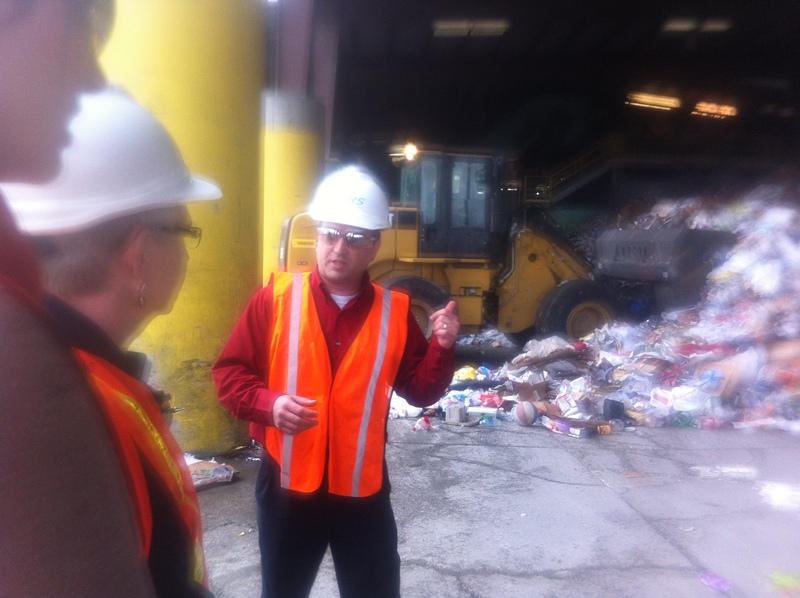 Visits also help us learn about local issues related to waste management, where our material will be sent and sorting practices that might differ from city-to-city. This ensures we can not only better educate event attendees to divert waste onsite, but advise our teams early on about materials we may want to avoid entirely in order to reduce event waste overall. So what did we learn this year? Following are our field trip postcards – check them out! 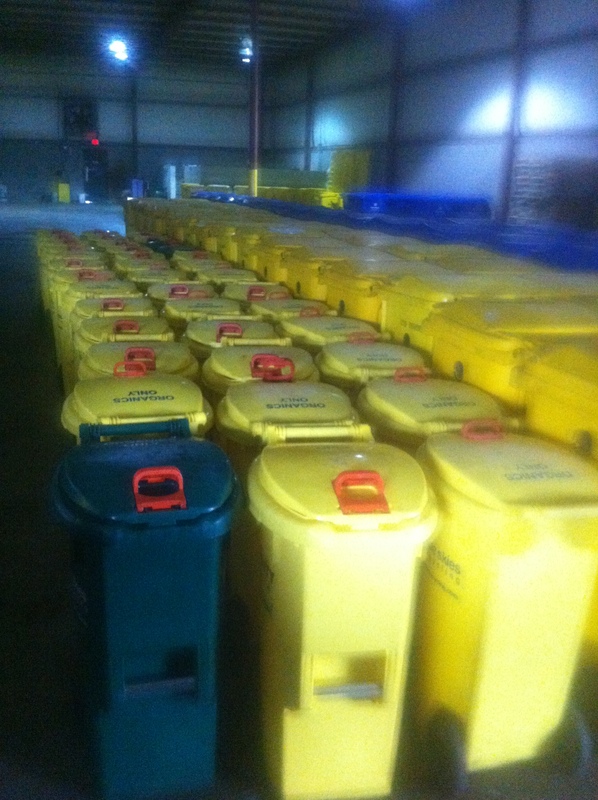 Our compostable serviceware and food waste will be taken by Koetter & Smith in southern Indiana. Their facility is huge! In fact it’s so big we needed a little bus to get see just a part of it. 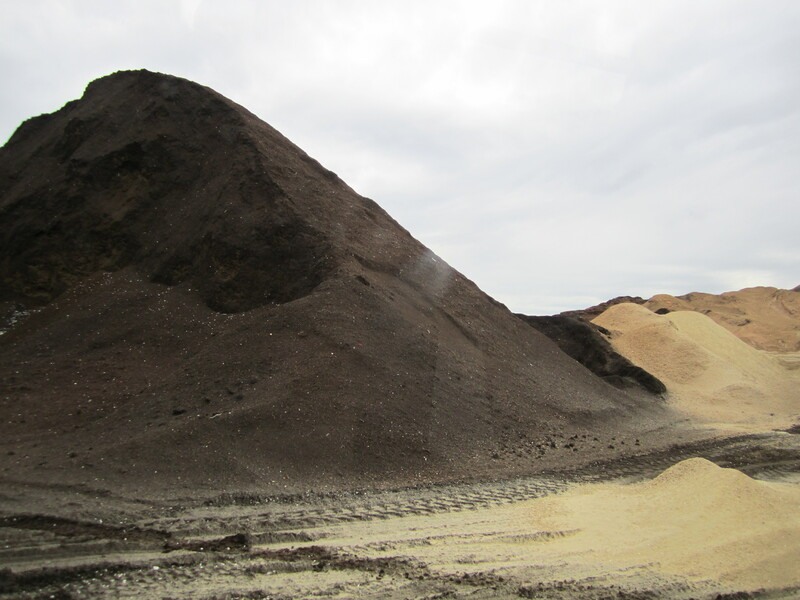 Koetter & Smith recycle approximately 400 million pounds of biomass each year. That’s enough to fill over 14,200 garbage trucks! 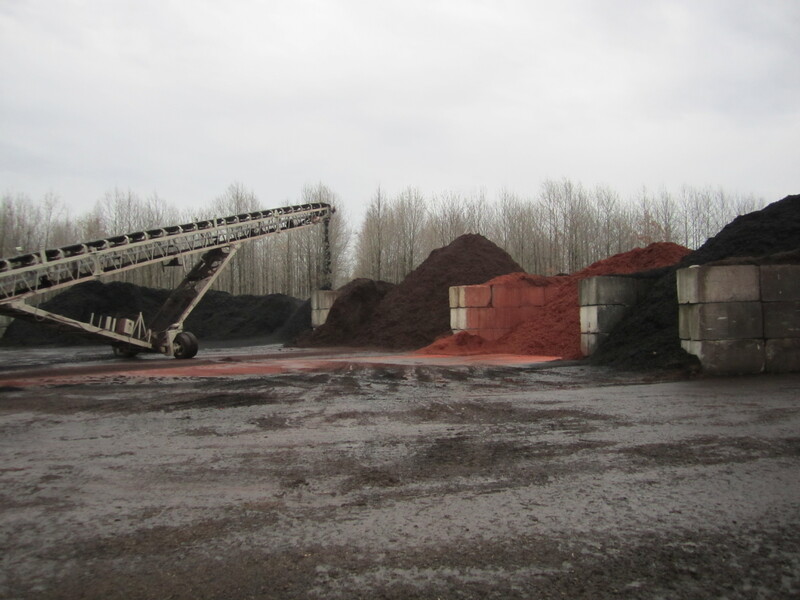 Materials are converted into mulch, potting soil (pictured above), animal bedding and fuel that is sold to major retailers. That’s right: our event food waste, coming soon to a Lowe’s near you! 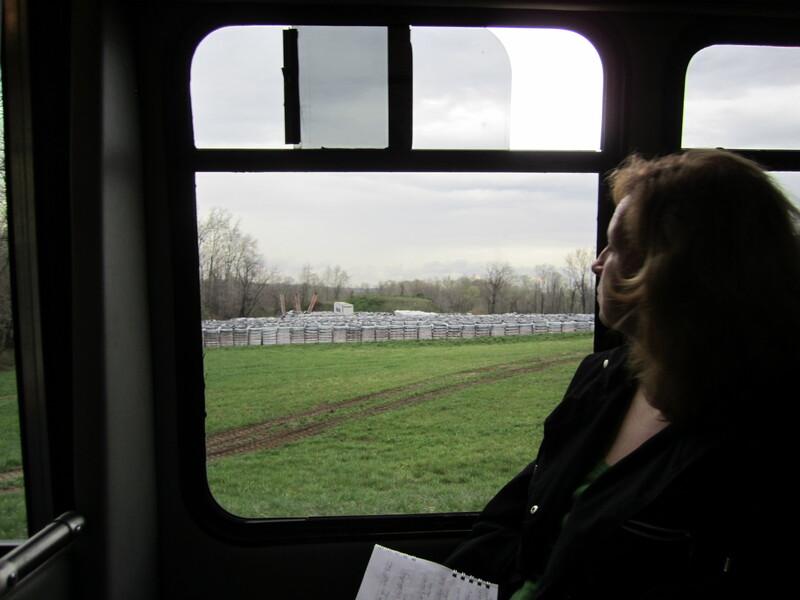 Pictured is Sarah Brockus of the United Methodist Women viewing pallets of potting soil awaiting shipment. 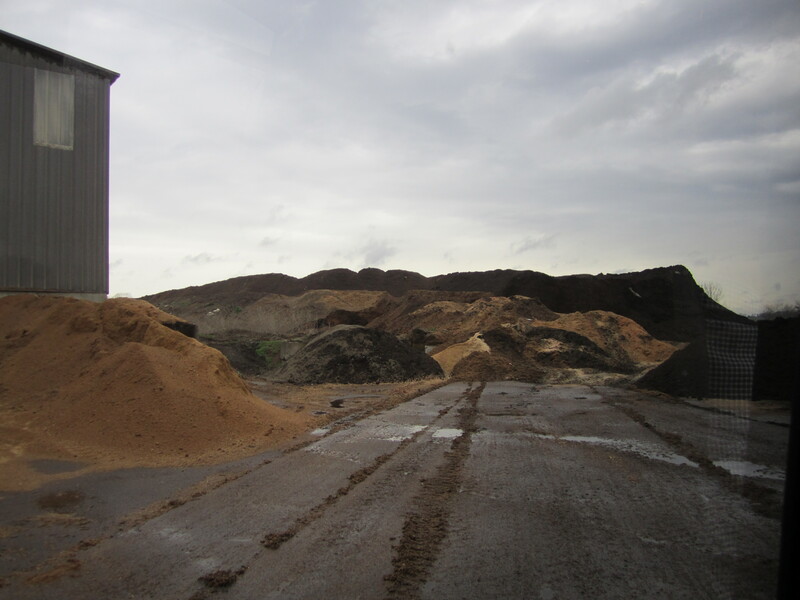 Koetter & Smith is a family run business that began by processing waste from local sawmills. Today the company employs 68 workers. Our tour was led by Nathan Smith (seated above), son of the company’s founder, who now oversees the business along with his brother Matthew. Also pictured is David Kohn of Blue Skies Recycling. Our event waste will break down in one of two large static compost piles pictured here. Material can take six months to one year to mature and breakdown. This process may be sped up using a “hot box” method that increases heat and decomposition. See that little flap in the wind sticking out of this pile? Or the little bits of white among the brown? That is plastic, something we don’t want to see in our organic waste as it will not break down before the material goes to market. And no one wants to open their potting soil to see a piece of an old shopping bag! 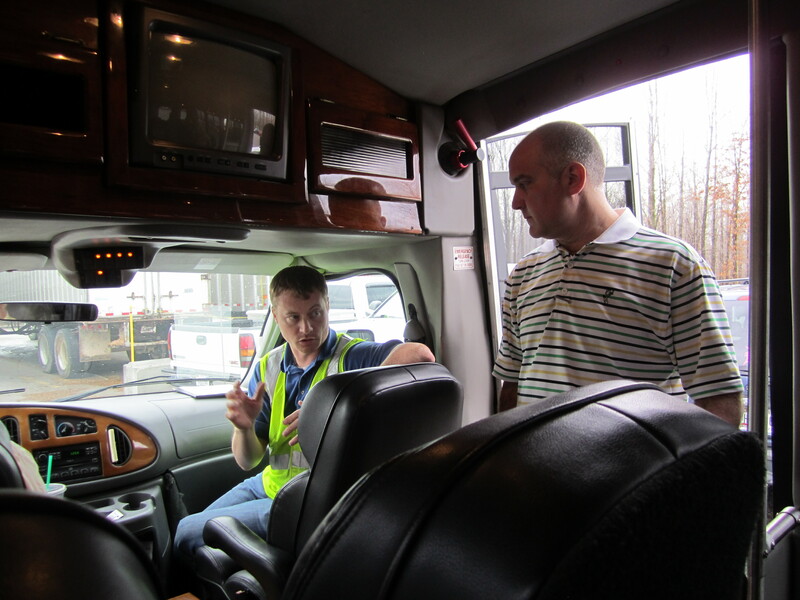 Contaminated deliveries are just one challenge operators like Koetter & Smith have to manage. Water quality testing is also required to ensure runoff from composting materials do not harm waterways. All recyclable materials from General Assembly will be taken as a single stream to QRS, the region’s largest recycler. QRS’s plant in New Albany, Indiana uses a combination of human labour and sorting machines to recover 95% of paper, plastic and metals received. This means only 5% of materials that arrive at the plant are landfilled, on average. QRS’s “Mousetrap”-inspired series of sorting machines use gravity, magnets and optical scanners to separate different kinds of materials. This enables QRS to take a mix of materials (including your entire Starbucks cup!) without the hassle of separating yourself. This does not necessarily mean that all plastics – especially lids – are kept from landfill, however. Small or unaccepted plastics are separated out and included in the 5% to landfill. Imagine for a moment this photo is set to a soundtrack of bombs going off. That is what it sounds like to hear glass bottles unloaded and sorted on the floor of QRS’s plant. During our visit Bryan Bogo shared with Jan Sneegas of UUA how glass is a very problematic material for QRS to manage. 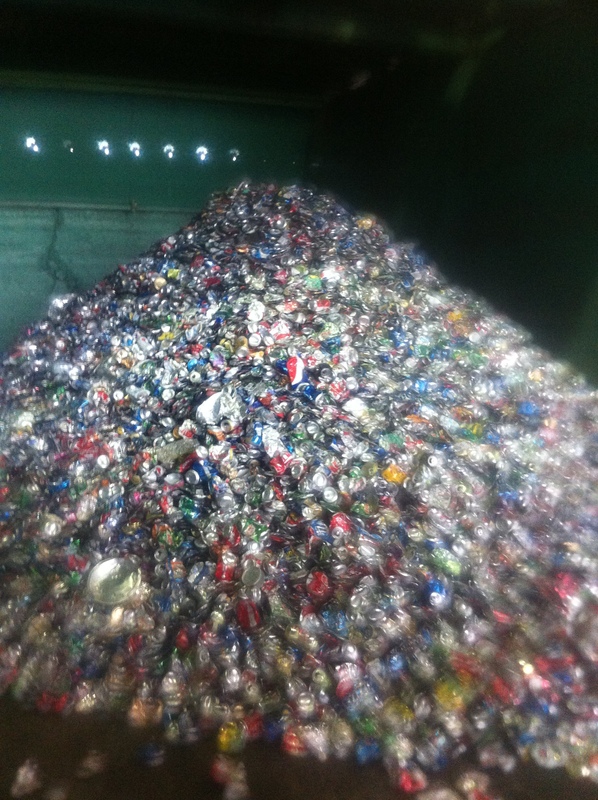 While they accept and recycle it, it is dangerous to handle and costs money to recycle (read more about this issue here). For this reason UUA will be handling glass as a separate stream at our event. Materials processed by recyclers are sold as commodities to re-manufacturers. The companies QRS markets recyclables to are primarily regional. Plastics are occasionally sold to off-continent buyers, but this is less common today as shipping to companies in China has become more expensive and regulated and Asia’s domestic recycling options have expanded. Most plastics from QRS will be sold to re-manufacturers in the mid-west. Paper also stays on continent. Aluminum (pictured above) is the most valuable commodity sold and is typically re-purposed into products within 60 days. 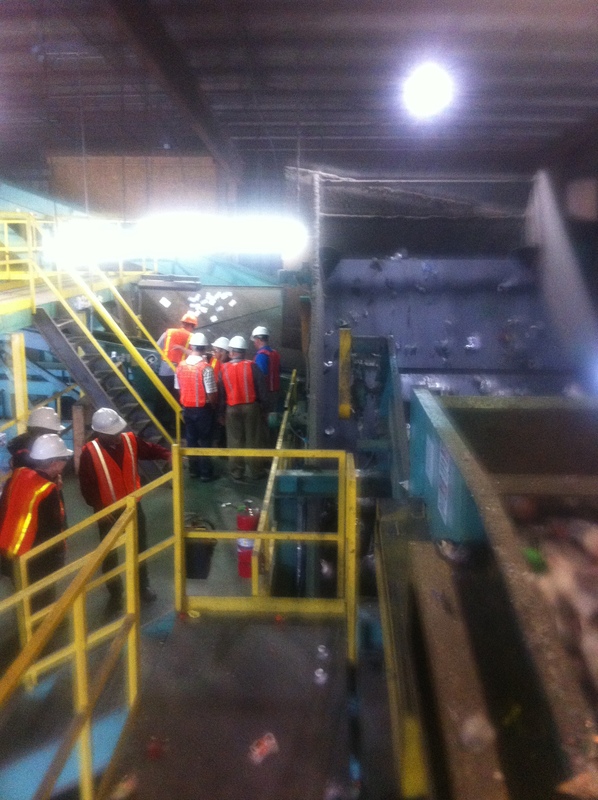 Our last stop was Blue Skies Recycling (BSR). BSR is a Louisville based-company who will be managing the pick up, measurement and distribution of our event waste to QRS and Koetter & Smith. BSR helps make the process convenient for our venue and caterer who would otherwise have to deal with three waste vendors. BSR will also take one last look at our compost to ensure there is no contamination, just in case any plastic made it past the watchful eyes of our volunteer waste monitors at the event. 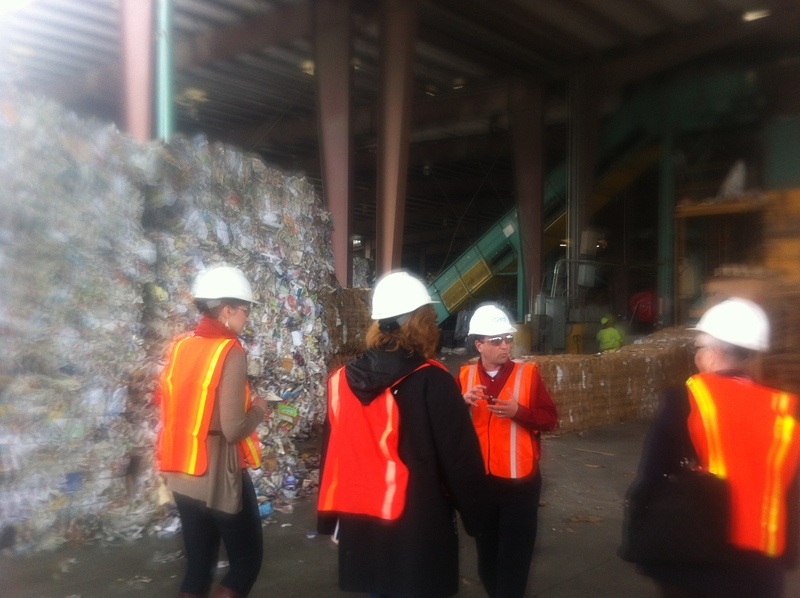 Thanks to Blue Skies Recycling, Koetter & Smith, QRS, Kentucky International Convention Center, Louisville Convention and Visitors Bureau and Centerplate for making our “Don’t Get Wasted” site visit possible!